← Holiday on the Costa del Sol: Do I need to hire a car in Malaga? Pulsating, hot, exciting. Historical monuments and warm, friendly people; a modern tourism infrastructure meets traditional Spanish way of life, a charming old town and kilometers of sandy beaches. This is Malaga and below are some reasons for visiting the Costa del Sol. 1 – The city: The gateway to the Mediterranean, the heart of the Costa del Sol. 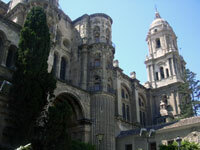 The city is an ideal starting point for excursions, as Malaga is situated among other interesting cities such as Granada, Cordoba, Seville and small, idyllic towns on the coast, and the white villages in the hinterland; all within a stone’s throw and can be easily reached with a car hire in Malaga. Everyone feels at home in Malaga: Whether party-seekers, beach goers, culture lovers or sports lovers – Malaga offers something for everyone. 2 – The people: The cheerful Malagueños (the citizens of Malaga) are a very relaxed and very courteous people, always ready for a joke or to help a lost tourist. They are characterized by their cheerfulness, spontaneity and openness. The loquacious Malagueños love to celebrate and socialize. In the evening they all meet up: going out, eating and drinking together is the Spanish way of life. Also during the week everybody is out and about, especially during the summer months; on the beach promenade are sitting families, youth and seniors and populate the excellent seafood restaurants or the streets next to the sea. Children are also at this time far from being in bed and are part of the action. The vivacious Spaniards are very open and always ready for a conversation. Definitely a place to feel comfortable. 3 – The culture and Museums: Malaga has a rich 3000 year history. Many buildings from the Muslim epoch as the fortress or the castle Gibralfaro still exist today and can be visited. The old town has to offer not only a great density of museums and the Picasso Museum, but also several ancient sites and buildings, and the cathedral. But there is also a great offer of modern art and Culture, as for instance in the CAC (contemporary art centre) or the Cervantes Theatre with a variety of music, dance and theater performances; furthermore there is a large palette of flamenco performances and live concerts, and throughout the year are being celebrated various festivals. 4 – The gastronomy: As a coastal region can be found in Malaga of course a lot of very good fish and seafood in all sizes and variations. Very typical of the region are all kinds of Pescaito Frito, fried fish, available in Malaga in many taverns, beach bars and of course, seafood restaurants. The most popular fish are yet sardines, roasted over charcoal and which are a real treat. Very popular and also widely available are shellfish and crustaceans such as prawns. Famous throughout Spain and also present in Malaga are Tapas, little appetizers, consisting of fish, meat or vegetables. There is also a delicious red wine from Malaga, beer or Tinto de Verano, a very typical mix of red wine and lemon juice. 5 – The climate: In contrast to the nearby high mountains ranges prevails in Malaga along the wide sandy beaches a very pleasant climate, which also guarantees in winter mild temperatures around 15 degrees. With 320 sunny days per year and temperatures around 30 degrees in summer Malaga offers besides all the attractions mentioned ideal conditions for the perfect beach holiday. 6 – The beaches: The Costa del Sol boosts a total of 160 kilometer coastline and beaches which generally have a high occupancy in urban areas and during the months of July and August. But you can also find some lovely coves and nudist beaches and during off-season we can enjoy miles of almost empty beaches in Malaga. 7 – The nightlife: Malaga nightlife requires endurance; for a night out in Malaga starts very late. It is always worthwhile, to go around 11 to 12 pm to the city center, before have a few tapas and then stroll the beautiful old streets of the city into the animated nightlife. Numerous clubs and bars offer entertainment and Spanish joie de vivre the whole night; also on the streets is always a lot going on as in southern Spain life takes place in the streets. This tendency increases notably during celebrations and fairs, such as Easter and the August fair, where virtually the entire population hits the streets to celebrate. Something definitely worth to be seen: During the August fair people sing, dance, celebrate, eat and drink virtually around the clock; there are fireworks, concerts, live music and people dance happily through the streets. There are many more reasons for visiting Malaga during the whole year, what is yours?